Holy Cross brother Andre Bessette was recognized as a saint on Sunday, October 17, at St. Peter Basicilica in Rome, thus becoming the first person canonized from the Congregation of Holy Cross; the founder of the order, Blessed Basil Moreau, is also a candidate for sainthood in the near future. Brother Andre was beatified by Pope John Paul II on May 23, 1982, and confirmed as a recognized saint by Pope Benedict XVI on February 19, 2010. 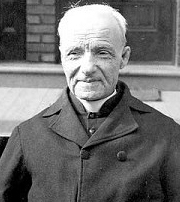 A frail, sometimes prickly, exceedingly holy, always humble man, Andre Bessette was born in Quebec on August 9, 1845 and died at the age of 91 on January 6, 1937. Upon joining the Congregation of Holy Cross in 1870, he was assigned as doorman or porter at the congregation's novitiate in Montreal. During the 40 years he spent in that capacity, his prayers to Saint Joseph are credited with leading to over 10,000 miraculous healings; the chapel which was built near the novitiate to accommodate ever-increasing crowds became the renowned St. Joseph's Oratory, founded by Br. Andre in 1904.